Here's a superb new online slots game from SlotsBaby. As you may have heard of before, luck is the residue of design. And you got to give credit to the developers at Pariplay Ltd for creating the online casino game called Royal Charm. This scratch card game bursts so many lucky charms on your screen, you feel like you're being blessed by higher beings when you start playing the game. You'll end up feeling like luck has become the oxygen that you breathe in when you get immersed in Royal Charm. Think about all of the traditional symbols of luck that you may have encountered at least once in your lifetime. Horseshoes, diamonds, gold, dice almost every symbol apart from the 4 leaf clover. Then imagine them all of them on the game board where you can place before you click or tap on 'play'. That's how Pariplay Ltd. Made Royal Charm a unique online slots games to play. Think of all of the best online casino games that you've played so far, and imagine how frustrating it was to utilise a variety of platforms to play them. With Pariplay Ltd., the developers have engineered a solution to that problem by bringing all of the game vendors that players use onto one single, simplified platform. Along with their innovating iGaming and iLottery platforms, Pariplay Ltd. plays a vital role in the online casino industry. And gaining fantastic reviews on their other games such as Froots, Pariplay Ltd. knows how to bring the real-life sensation of a casino game to your screens, with a little touch of fun to keep you entertained again and again. If you love promo's don't forget to check out our Slots Promotions. As mentioned earlier, what makes Royal Charm unique is the option to place a charm on a card before you hit the play button. This is done by dragging one of your lucky charms and settling them onto one of the 9 blocks that are presented on the game board. As they say, luck comes in courses of 3, and if the player finds 3 identical cards once they flip them all on the game board, they win the price according to the pay table. If luck is truly on the player's side, and the card that they have placed their charm on happens to be the winning one, they unlock a BONUS FEATURE called the Bonus Charm Round, where 3 treasure chests will present themselves in front of them. If they manage to select 1 of the treasure chests that's filled with all of the luck you could think of, your winnings will be amplified by the multiplier that'd be contained inside that chest. This BONUS FEATURE is what makes all of the online casino players believe in the power of luck and revel in this iconic scratch card game. 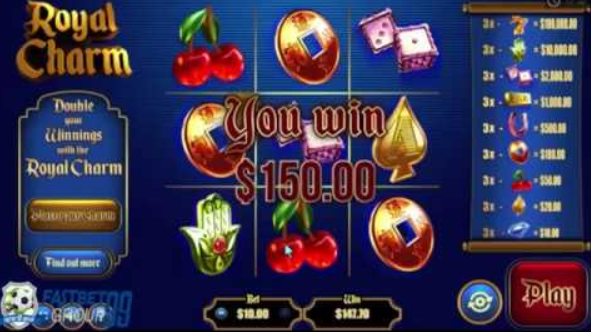 With all of the scratch card games that you can search and play on a variety of casinos online, Royal Charm has struck the hearts of many players and woo them with the mysterious algorithm of luck. There are not many scratch card games on the internet that can make players obtain the interactive experience that Royal Charm can provide, which is the reason why they give credit to the wonderful developers behind Pariplay Ltd.
Why is it that so many people are obsessed with the idea of luck? Well, not only are they eager to discover what it could give them, it also entices them to feel the adrenaline rush of wondering what it could give them.